The start of the three-part story has several moving pieces including the introduction of another thief to give Usagi and Inspector Ishida trouble, an unknown street urchin keenly eyeing the investigation, and rumblings inside the Black Goblin Gang which are likely to cause trouble for everyone in the town. With Usagi getting himself in over his head as the comic comes to a close, I'll be curious to see where the story takes him. Once he regains consciousness, that is. 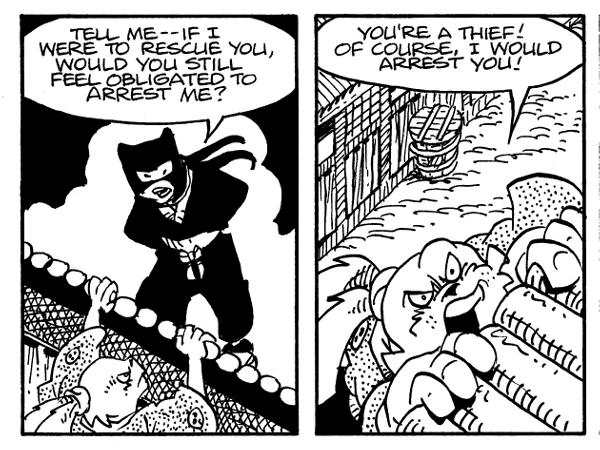 Usagi Yojimbo #163 also includes another page of the ongoing Chibi Usagi story. Worth a look.